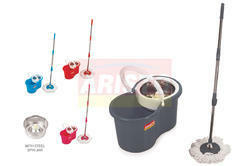 Pioneers in the industry, we offer magic spin mop, super spin mop, easy spin mop and mop bucket from India. 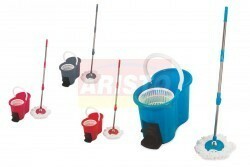 Easy to clean mop is specially made from vergin first class plastic. It is a european style with 360 degree rotating. This mop set from easy to clean helps you clean every corner while standing and without the inconvenience of touching dirty water with your hands. The long rod that connects in 2 parts is adjustable even to clean below the furniture. When assembled, the rod will be of an appropriate length for you to mop the floor without straining your spine. Spin the mop head in the bucket to remove excess water. Adjustable rod this mop has a long, adjustable rod that helps clean hard-to-reach areas without straining your back. 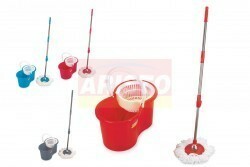 Product Description / Specification Easy to clean mop is specially made from vergin first class plastic. It is a european style with 360 degree rotating. This mop set from easy to clean helps you clean every corner while standing and without the inconvenience of touching dirty water with your hands. The long rod that connects in 2 parts is adjustable even to clean below the furniture. When assembled, the rod will be of an appropriate length for you to mop the floor without straining your spine. 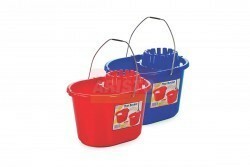 Spin the mop head in the bucket to remove excess water. Adjustable rod this mop has a long, adjustable rod that helps clean hard-to-reach areas without straining your back.